They're showing their age now, but the Bose QuietComfort 25 offer a deluxe set of noise-cancelling headphones that delivers an unparalleled audio experience that's well worth the price of admission. The Bose QuietComfort 25 Headphones was added to the Head Phones category in December 2018. 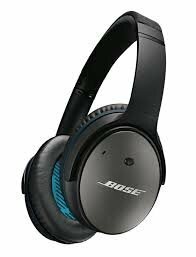 The lowest price GetPrice has found for the Bose QuietComfort 25 Headphones in Australia is $54.94 from Amazon AU.